Does Google Rank Keyword Rich Domain Names Higher? Does Google Rank Keyword Rich Domain Names Higher on Search? Keyword rich domain names may play a significant role in ranking websites high on search engine results pages (SERPs). For example, exact matches such as “backpain.com” might have a better chance of being found in the top 5 rankings for the term ”back pain”. Is this fair? Does this serve the searcher? Business owners spend thousands of dollars on Search Engine Optimization (SEO) to have “search engine friendly” websites to outrank their competitors. Many people think that all you really need is a keyword rich domain name for a successful internet marketing campaign. Google has been continuously tweaking its algorithm to improve the quality of its search results; penalizing those who attempt to fool the ranking system. Google bots target low quality websites that have spammy content and take them off the ranking system. All of this is to Google’s credit. One of Google’s latest algorithm updates is the “Penguin update”. This update penalizes sites that use “black hat” tactics to rank higher on the Google SERP’s. This new algorithm update is intended to reward high-quality sites with unique and useful content. 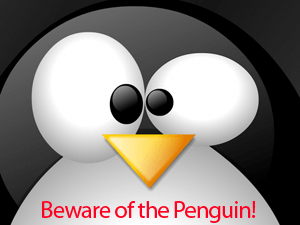 Having over-optimized and poor content and also using excessive backlinks from sites with low authority will make your site vulnerable for penalization from Penguin. These changes are often subtle, but at times Google will make major changes that alter search results significantly. Often when one site references another site, the “anchor text” (visible text in a link) in the content itself is used as a domain name. The main advantage of having a keyword rich domain name related to your industry is the traffic that comes with it. When a prospective customer searches for a topic, imagine, the first domain listed organically is an exact match. With anchor text also playing a significant role in search engine results, this is truly an unfair advantage for any business that does not have a keyword rich domain name for their site, most likely meaning YOU. Instead of being “spammy”, to avoid getting hit by Penguin, you should start targeting your audience through creative, SEO-friendly elements. No, we don’t mean flash, we mean CSS3 and HTML5! Our most popular backlinks came from our own beloved superhero, Spiderman. Just by adding a touch of creativity and fun to your website you can stir up quite a buzz just as we have. Another example of using CSS3 to help bring in conversions is the Evil SEO Octopus design. We have taken several sprite images and through CSS3 combined them all to make you feel like a giant octopus is watching you while your on the site. How neat is that? Any kind of link bait works wonders with Panda, so get to work and get creative! This has been abused by spammers registering hundreds of “long-tail” domains to rank them for exact matches. Nowadays, it is almost impossible to get a hold of any “exact match” domains that wouldn’t be too long or pointless. The fact that a site has an exact match for a search term should not automatically make that site a page 1 or number 1 rank for that term, especially when it can be easily shown in thousands of examples how sites with much more relevance and quality for the search, rank well below these exact match URLs. However, if the domain you have is Facebook.com, you would receive many more links containing the keyword “face or book”. Go ahead, search the keyword “face” or the keyword “book” and see what comes up first, then search “social media”. If “social media” was the keyword that related sites want to rank for, you would think that Facebook.com would have an advantage for this term. Not only would keyword rich domains get more links with the proper anchor text, but Google does not filter those anchor text links because of the keyword being in the domain name. Here at Optimum7, we’ve conducted research on the importance of keyword rich domain names and the unfairness of their rankings. Websites that contain organically richer content are becoming outranked by sites with exact match domains. 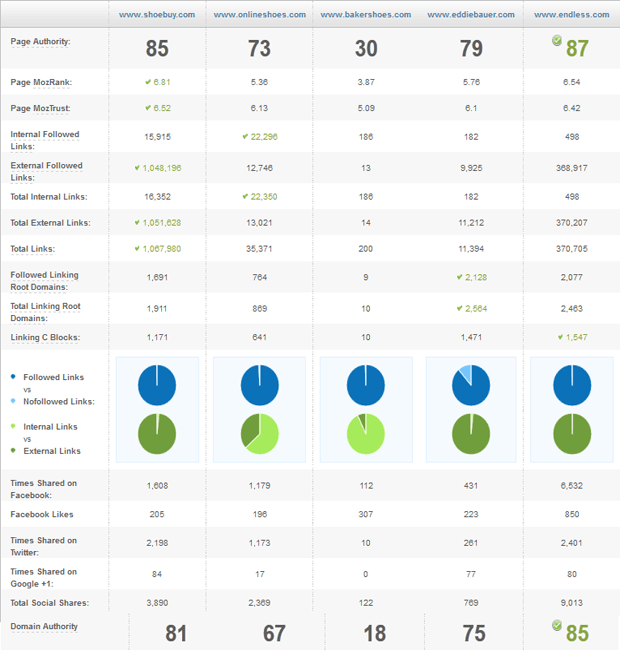 The upcoming graphs will explain the amount of links, organic keywords, PPC keywords, social media platforms, page and domain authority, and much more. You need to take notice, stand up, and do speak out about this unfair and counter-productive practice. 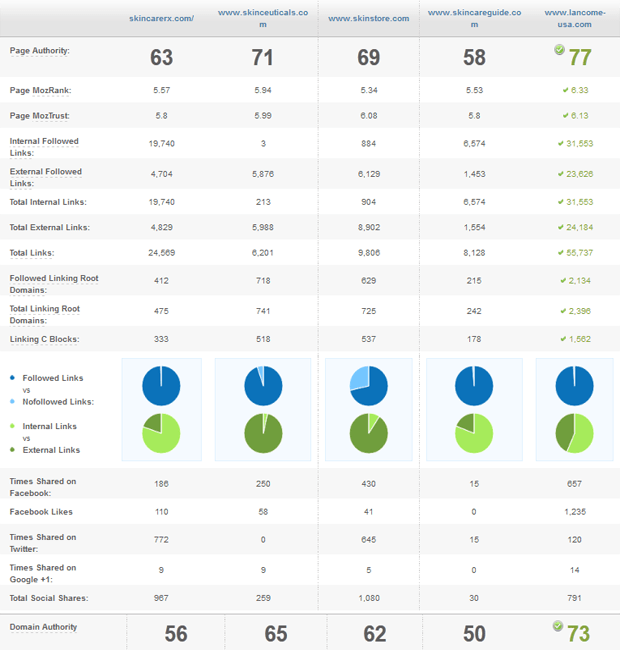 The social metrics were added by SEOMOZ and updated throughout 2011, and are helpful for those that have recognized the increasing importance of social indicators to Google’s ranking algorithm. Additionally, for every backlink, you have the ability to see the exact location and the anchor text (keyword) of the link. This is a great way for older sites to identify how and where to start improving their current backlink profile. 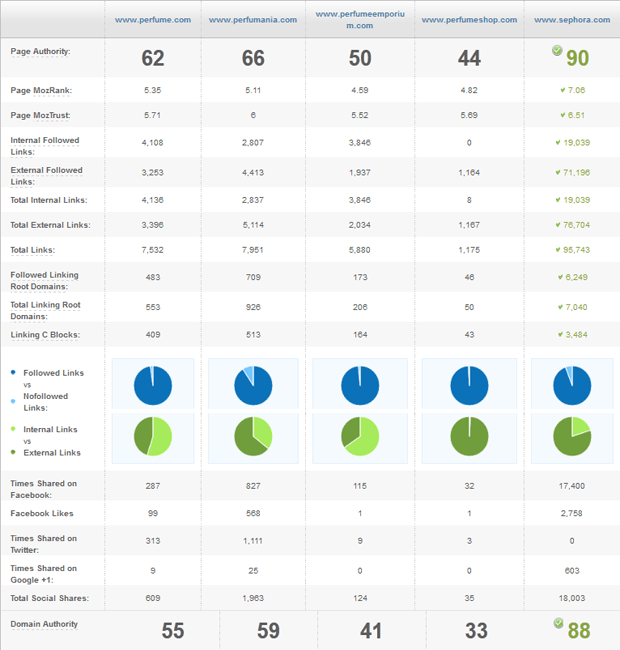 Kombat: What makes Spyfu Kombat such a great tool is that is shows you a graphical image of 3 companies that represent the data for Paid & Organic traffic. 1) “Criminal Attorney”is a common search term with search results averaging over 75 million listings. For this study, we grabbed three websites with keyword rich domains and 2 without. 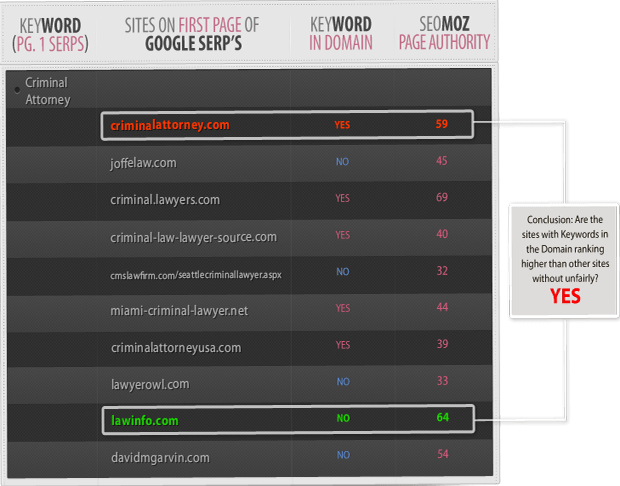 On Spyfu, Miami-criminal-lawyer holds the most organic keywords for its site. 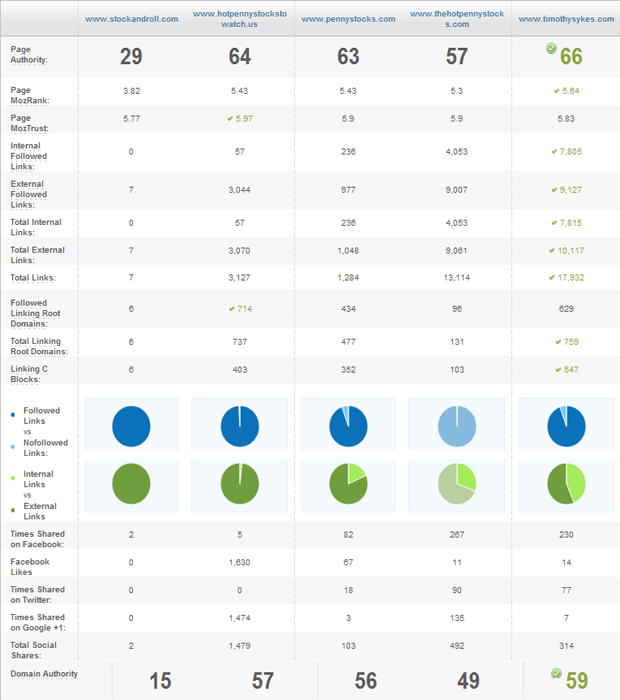 The Site Explorer data states that Joffelaw.com should be ranked higher than all of its competitors due to its higher page and domain authority. Second place is not bad, but, you can be almost certain that Joffelaw.com has invested more time on their internet marketing with SEO than Criminalattorney.com. This data states that either Joffelaw.com or Miami-criminal-attorney should rank higher than the company ranking first, at the moment. Is it a coincidence that Criminalattorney.com ranks #1 on Google SERP’s? 2) “Gold Jewelry” is a very competitive term with over 44 million search result listings. This Keyword is being abused across the charts as you can see on the search results. Many websites use the keyword “Gold jewelry” on the page titles and also snippets apart from using them on the domain names to rank higher. 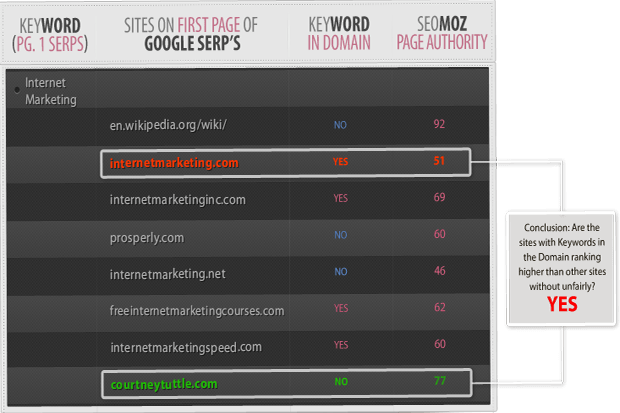 This data clearly indicates that Sarraf.com should rank the highest. Sarraf.com is visible for a larger amount of unique keywords in contrast to Goldpalace.com which ranks #1. 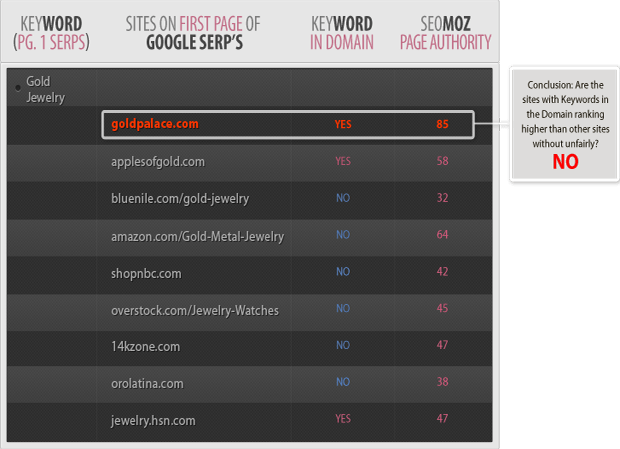 Open Site shows us that Sarraf.com has a higher page authority even though this site is listed on the second page of Google SERP’s for “Gold jewelry” at the #16 spot. 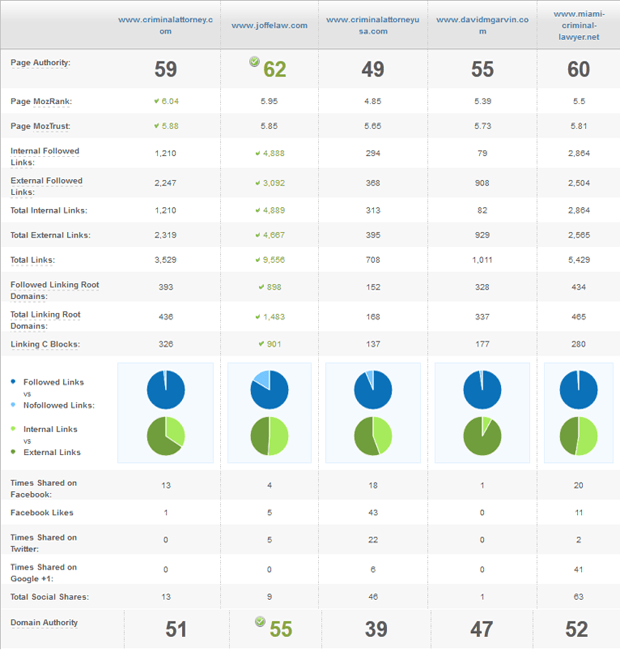 Bluenile.com has the second highest page authority and the highest domain authority, but, since they have the keyword “Gold jewelry” on the URL of a deep page (the home page does not rank for this term) they are ranking third. 3) “Skateboards” now when we talk about Keyword abuse on SERP listings, it does not get anymore abusive than this. On the search results you’ll need more than one hand to count the amount of times they use the term “Skateboard”. 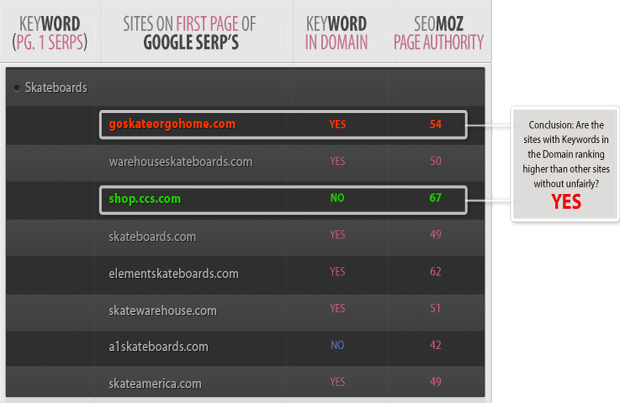 GoSKATEorgohome.com is a prime example of a bombardment of a keyword on a search listing. As you can see in the given data, their organic keyword uniqueness is not as broad and they don’t rank high by Site Explorer standards. Prior to making the snapshot of the search results for “skateboards”, Skateboards.com was ranking #1, but, as you can see they have a bit more unique keywords than Goskateorgohome.com. 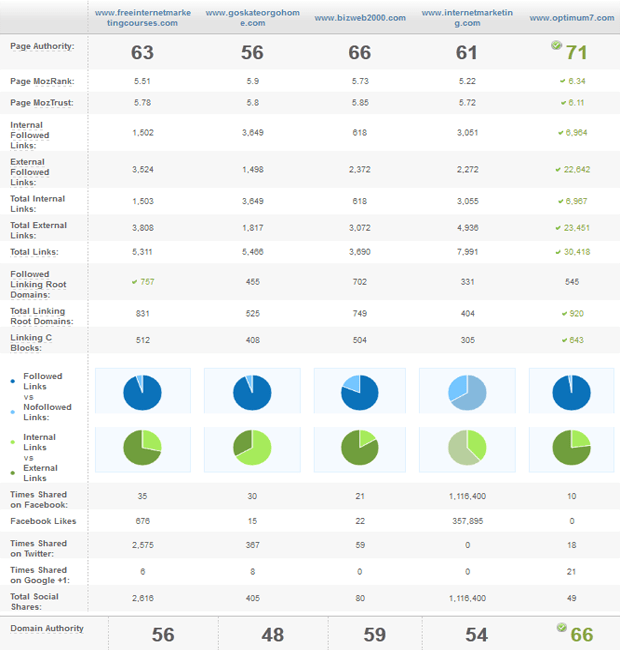 Blackholebards.com has the highest amount of unique keywords by Spyfu standards and Zumiez.com has the highest page and domain authority. In an upcoming research, we will be talking about the effect that PPC (Google AdWords) has on Google SERP’s. The second Spyfu chart shows how much more they spend of paid advertisement than their competitors. Does this seem fishy to you? 4) “Penny Stocks” is not a very popular keyword, but, competitors take advantage of this unpopularity by having keyword rich domain names. 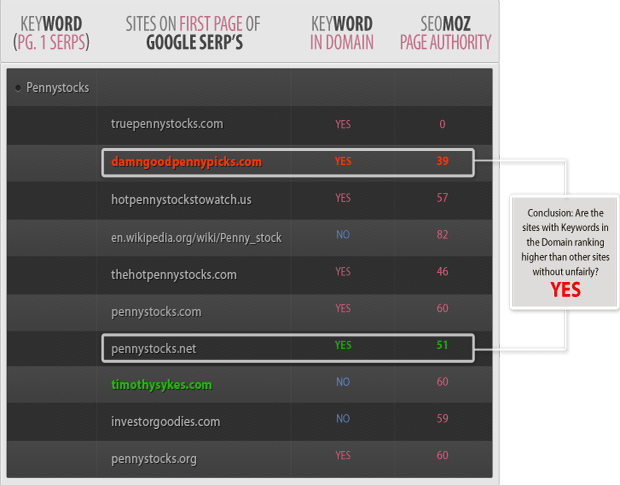 As you can see, almost every company listed on the first page of Google SERP’s has the keyword “Penny stocks” in the domain. One of the few that does not have a keyword rich domain name is Timothysykes.com, which happens to have, by far, the most unique keywords and the highest page and domain authority. At the time this snapshot of the search results was taken, Timothysykes.com was ranked #8 on the first page. With all the SEO work that was done for Timothysykes.com, you would think they would outrank ALL of their competitors. This is not the case as you can see; this is a prime example of exact match “uselessness” in search results. What happened to the principal that the best, most relevant sites being ranked highest? 5) “Social Media”, this keyword being disputed is the “the straw that broke the camel’s back”. What’s the first thing that comes to your mind when you hear social media? Facebook, Twitter, LinkedIn, Foursquare, even MySpace; but do you think of Wikipedia or Socialmediatoday.com? The Google bots seem to think so. You can search Facebook right now on Google and you will find it on the second page ranked #12. #12, really? You got to be kidding me. This is actually the first site that I’ve seen with a domain authority of 100. 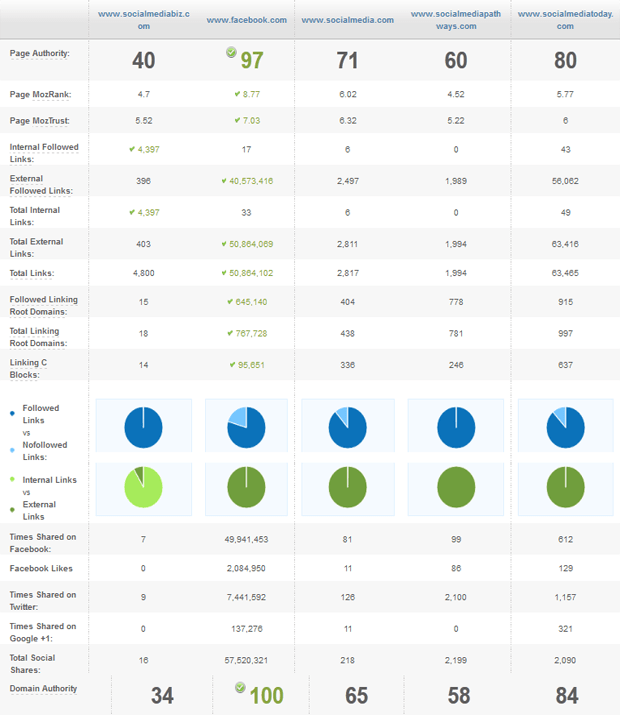 The amount of unique keywords Facebook possesses is enough to withdraw from working on the site’s SEO for a LONG time. 6) “Internet Marketing” is a keyword that every internet marketing firm wants to rank high for, but, as you can see, the ones that are ranking high are the companies with keyword rich / exact match domain names. Optimum 7, by far, possesses a higher amount of unique organic keywords being searched than the #1 website on Google SERP’s for the term “Internet marketing”. If you search right now, Internetmarketing.com is currently #1. You would think that “Internet marketing” would be a difficult keyword to rank for due to the fact that there are many professional internet marketing firms around the world trying to rank for it, but, it seems that all you need now-a-days is a keyword rich domain name to rank on the first page of Google SERP’s. 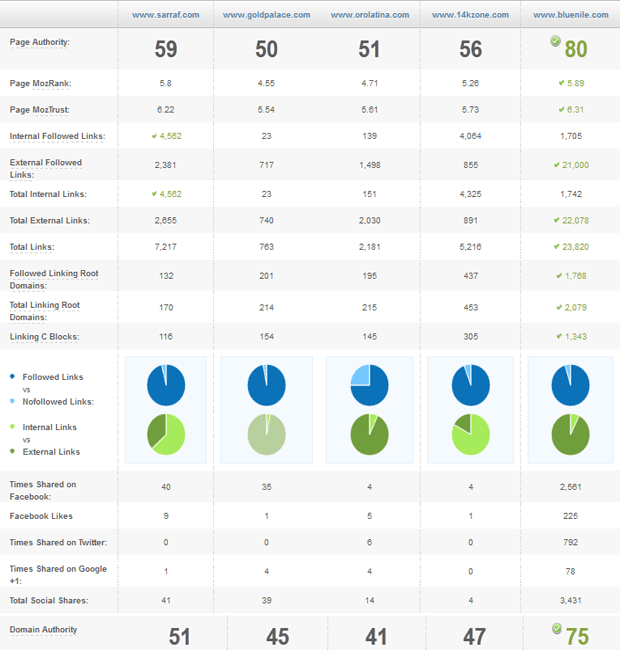 Expo-max has the highest page and domain authority compared to most competitors on the first page of Google SERP’s including the #1 URL, Internetmarketing.com. Expo-max is currently ranked #63 on the 6th page of Google SERP’s. Can you believe this? Is this not outrageous? 7) “Perfume”, ahh… this is a good one, with over 313 million search results; which one of us do not use or at the very least know someone that uses perfume? Well, at least Perfume.com is currently not ranked #1. The #1 position goes to Perfumania.com, not much of a difference. Check out Perfumania.com’s snippet and page title; all together, they use perfume around 7 times in their search listing including Perfumania. 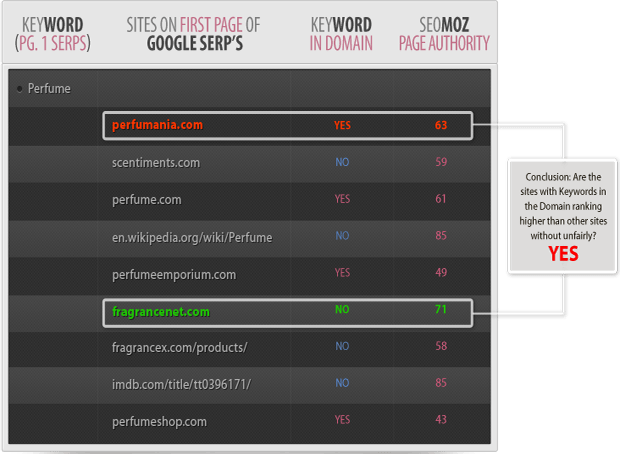 Sephora.com holds the most unique keywords being searched and also holds the higher page and domain authority by comparison to the competitors ranking on the first page. 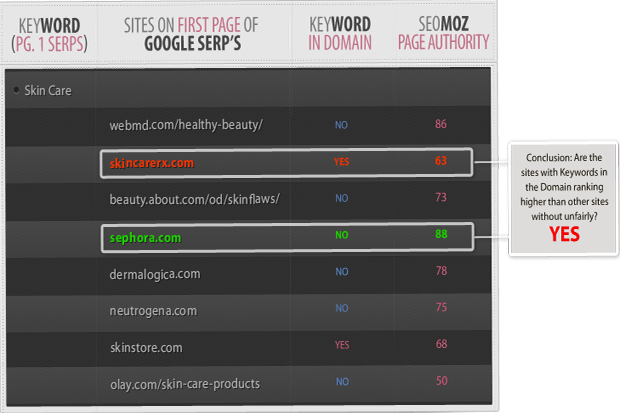 Sephora.com is currently on the second page of Google SERP’s as rank #14. 8) “Skin Care” has over 386 million search result listings, it is obvious that this keyword is very sought after. However, if you look at the data, many companies are unfairly being pushed down on Google’s SERP because of Keyword rich domain named sites such as “skincarerx.com” and “Skincareguide.com” which both have the full Keyword in their domain. A company shouldn’t have to change their name just so they can rank higher in search engines. For example you wouldn’t find a store in your shopping center called “Skin Store”, but you would see store names such as “Lancome”. Lancome-usa.com ranks higher for page & domain authority than any other domain name that has the words Skin Care in them. You won’t Find Lancome on the first page, or the second, try the fourth page, where visitors rarely visit. 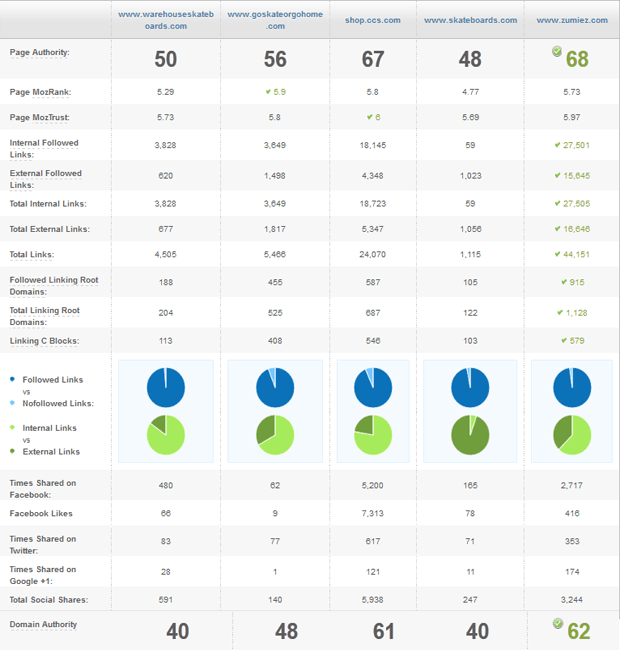 Websites that put out quality content have good traffic and keywords; they should be much higher but we are still seeing this trend where Google lets them down. 9) “Women’s Shoes” Now when was the last time you walked into your local shopping center and saw a shoe store named “ShoeBuy”? That is not the typical way that businesses create their names; they try to come up with unique catchy names such as “Endless.com”. Unfortunately, out of the 81 million results you won’t find “Endless.com” at the top of Google’s search results even though it ranks higher for Organic visitors and higher page & domain authority. 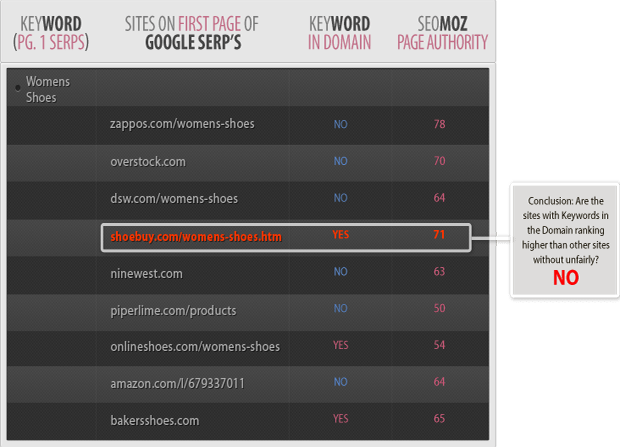 Once again businesses that use the method of spamming their domain name with keywords such as “shoebuy.com” are unfairly outranking businesses that are clearly of higher quality, relevance, credibility and authority. Google wants to minimize the influence of keywords in domain names without penalizing companies with the actual keyword on their brand name. At the moment, the Google algorithm does not seem to be capable of differentiating a website with a higher domain authority over spammy websites with exact match domain names. This flies in the face of what Search is really supposed to be all about; exact match domains shouldn’t trump seemingly everything else that deemed so important to search results. Google needs only to consult its own public documents starting with Google Webmaster Tools. If you’ve been operating the right way, building up good and unique content, on a good structure, that’s pulling in good quality and relevant links, then you shouldn’t have to worry much about Google algorithmic changes. If your strategy is based around keyword rich / exact match domain names, then you may want to start thinking up some new ideas. This research resulted in a 50.6% 1st page ranking of keyword rich domain names. Basically, more than 50% of websites that come up on the first page of Google SERP’s has a keyword rich / exact match domain name. 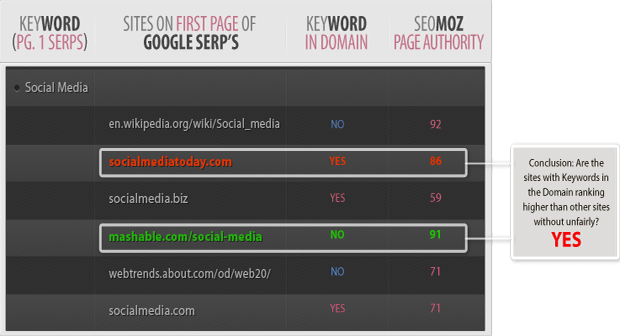 6/9 Keyword rich domain names hold the number 1 and 2 spot for Google SERP’s through the given data. At the time, Google is giving sites with keywords in domain name more authority over sites that do not have keywords in domain name. 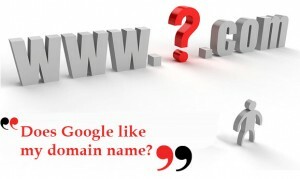 It seems that the whole problem of keywords in domain names is the product of companies taking advantage of this method. Companies buy up keyword rich domain names and link back to their official website. These “content” sites are receiving more importance through Google’s ranking system than websites with a large number of backlinks, great SEO work, unique content, high domain authority, etc. This is not a bad tactic, since, it gets you on the first page, but, once Google becomes more strict with their focus on website quality, you can kiss your low quality, high- ranking, keyword rich domain named sites, goodbye! Frankly, we welcome this improvement in Google’s algorithm. The results will be better for the user and isn’t that what Google is supposed to be doing? Panda was all about raising the bar for websites to produce quality content to demonstrate their relevance, credibility and authority. This “practice” of ranking exact match domains at the top of the SERPs flies in the face of what Google says they are supposed to be all about. We think it’s time for Google to step up here once and for all. Sound off about this if you share our beliefs. Share your comments. Tell us where we went wrong. Provide us your evidence supporting or conflicting with our findings.